Celiac disease affects approximately 1 in 70 Australians and 1 in 133 Americans, and around 83% of people who have celiac disease are either undiagnosed or misdiagnosed. This means the vast majority of people who have celiac disease don’t yet know that they have it. Celiac disease is a serious autoimmune disease. It is triggered by consuming a protein called gluten, which is found in wheat, barley and rye (just to name a few). When people with celiac disease eat foods containing gluten, their immune system responds by damaging the finger-like villi of the small intestine. When the villi become damaged, the body is unable to absorb nutrients into the bloodstream, which can lead to malnourishment. Left untreated, people with celiac disease are at-risk for serious health consequences, like other autoimmune diseases, osteoporosis, thyroid disease, and even certain cancers. There are more than 300 different symptoms of celiac disease, and symptoms can be different from person to person. What are the 3 main causes of Celiac Disease? When a person with celiac disease consumes gluten (even trace amounts), the immune system responds by causing damage to the villi, which are very small finger-like projections found along the wall of the small intestine. When the villi are damaged, the small intestine can’t properly absorb nutrients from food. Over time, this can lead to malnourishment, as well as loss of bone density, brain fog, anxiety, infertility, inflammation, digestive issues (bloating, stomach pain, diarrhoea or constipation), aches and pains among other symptoms. Certain gene mutations (HLA DQ2/DQ8 genes) are known to trigger celiac disease, however only 2-3% of people with them actually develop celiac disease. The lining of the intestines is a barrier that should only allow properly digested fats, proteins, and starches to pass through and enter the bloodstream. However, it’s when our bodies are bombarded with antibiotics, medications, bacterial toxins, or even the pesticides sprayed on our food as well as consuming inflammatory causing foods like wheat and other gluten containing grains, the intestinal lining gets damaged and loses its integrity. This results in bacteria, viruses, parasites and even undigested food molecules passing through the walls of our gut lining! This causes the immune system to be over stimulated, inflammatory substances are released which weakens the intestinal wall even further. This is often referred to as ‘Leaky Gut’. The agitated immune system can often become so unstable that it ends up attacking your own body, therefore producing autoimmune diseases. 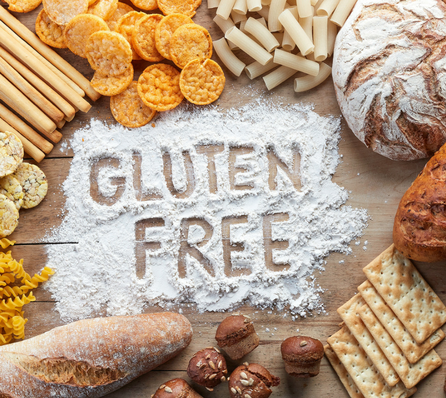 I would recommend you read this blog ‘Why you need to eliminate gluten completely if you have an autoimmune disease’ for additional information on how gluten causes inflammation, leaky gut, gut dysbiosis, and brain issues. I also recommend to my clients who suffer from autoimmune disease such as celiac disease or even other digestive issues to maintain a strict 100% gluten free diet. Going gluten free can seem overwhelming at first, but you will quickly learn what healthy substitutes you can make for your favourite foods and how to cook gluten free. Visit our recipes and blogs for some inspiration. Are your gluten-free foods really gluten free? I also recommend to start working on healing and sealing the gut lining because for many, simply removing 100% of gluten from their diet isn’t enough. The damage that has been caused to the gut lining must also be healed. Additionally, I often find that there are other infections in the gut such as parasites, candida, bacterial overgrowths, and bacterial imbalances that need to be addressed and corrected. For some people, there may be a need to go completely grain-free. The first step is to identify and remove the source of the gut-lining irritation, rather than attempting to suppress the irritation with drugs (the ‘Band-Aid’ approach).. Start an elimination diet – remove common irritants such as; gluten, dairy, sugar, soy, GMO foods, packaged food that contain chemical additives and preservatives. Just by eliminating these common irritants it may be able to provide surprisingly quick relief. For more information and tips on how to soothe your gut, please read the following blogs and watch the free ‘Beyond Good Nutrition’ 4 part gut health video series. If you need more support then the online guided program ‘6 Weeks No Wheat’ will guide and educate you each week, on what you can eat, what you need to look for and how to make lifestyle changes. You will also be supplied a weekly meal plan with easy and delicious recipes to prepare. If you need more individualised advice, seek guidance and support from your chosen health care practitioner. Thank you for this article, short, simple and to the point. I have the genetic predisposition and leaky gut. I did a test called Wheat Zoomer and it showed that I’m making antibodies to a few parts of wheat, but not gliadin. It also showed I didn’t have Celiac. I had eaten wheat average 1.25 servings a day for 3 1/2 months before this test. I’m trying to see if I can eat wheat once in a while if I take care of the leaky gut?